I found this fantastic painting while browsing flickr, unfortunately there was no artist name attached to it. If anyone knows who painted this I'd appreciate knowing, it's apparently someone out of this list. A larger copy of this can be found here. Groenling, the person who posted this work on flickr has a vast collection of photos taken from various churches and musesums all over Europe. Check it out. I'll be mentioning more artwork from this collection later as I search through it. 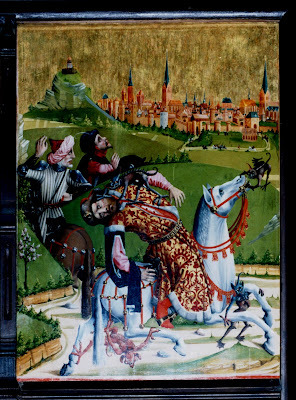 Here's a great photo they took of a painting showing Saint George defeating the dragon. View a larger sized version here. 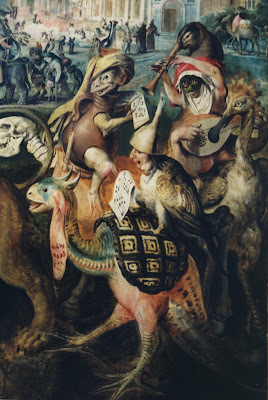 Hi Aeron, the picture is a detail from Marten de Vos, "St Anthony",-how did I know? - you posted it on 17th Jan !,(but reproduced in reverse) Paul. Ha, thanks I thought I'd do that someday!